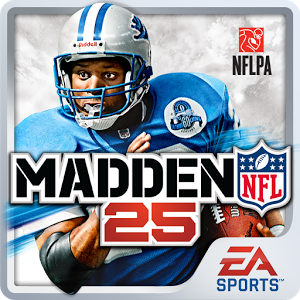 Update now for a faster, smoother MADDEN NFL 25 experience. We’ve made some off-the-field improvements to keep your game in top shape. SPECIAL NOTE: Please make sure you have room on your device before updating. If not, please DO NOT DELETE unless you’ve saved your progress by connecting to Facebook. Thanks for playing MADDEN NFL 25! Compatibility: Requires iOS 5.0 or later. Compatible with iPhone 4, iPhone 4S, iPhone 5, iPhone 5c, iPhone 5s, iPad 2 Wi-Fi, iPad 2 Wi-Fi + 3G, iPad Wi-Fi (3rd generation), iPad Wi-Fi + Cellular (3rd generation), iPad Wi-Fi (4th generation), iPad Wi-Fi + Cellular (4th generation), iPad mini Wi-Fi, and iPad mini Wi-Fi + Cellular. This app is optimized for iPhone 5.